Well, I won't bore you with the details of my ENTIRE day, but I took a trip slightly out of my way to stop by Up, Up and Away Comics for their FCBD celebrations. The parking lot was packed, but I got the last open spot, as I was directed in by a TIE-bomber pilot and Spider-Man. I thanked them and stepped inside to find a pretty packed house. I tried to step through and off to the side a bit to get a lay of the place. Fortunately, I had been there before and knew the basic set-up. But they had evidently cleared out a little area towards the back for Tony Moore, who was already signing and sketching away. One of the bookshelves which I think normally holds just Superman books had been populated with the Free Comic Book Day material. Mostly just the Gold Sponsor books by the time I got there, but a few Silver were left. The hardcovers, paperbacks and manga seemed pretty much how I remembered them. Some new books in stock of course. The back wall also had several new books, including a few small press books that I hadn't realized had even come out. I was in the store about an hour, and it was hopping the whole time. Not so crowded that you couldn't move or had to trip over people, but a very healthy crowd. A fair number of young kids, too. I think I saw around a dozen that were short enough that you had to be standing right next to them to see them in the store. 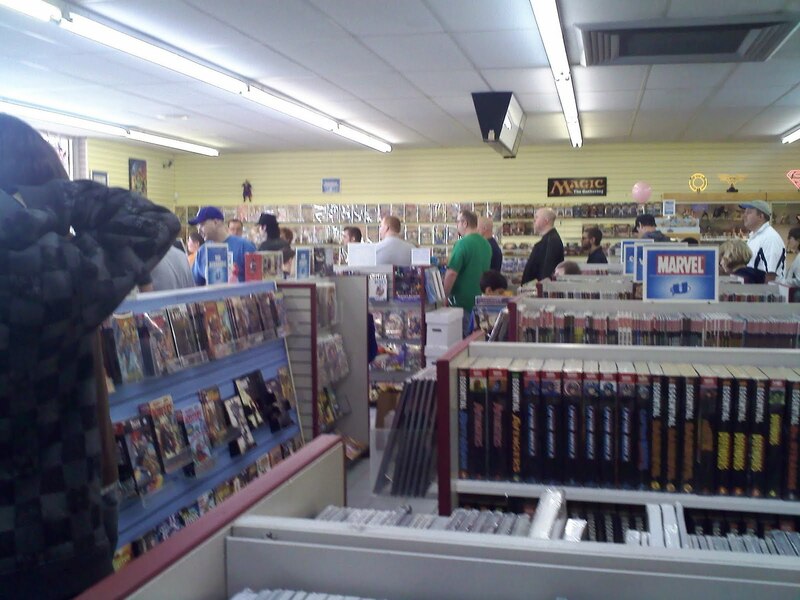 I've been to FCBD events before where the owners/managers seemed to only go along with it grudgingly. I've been to one other where the owner embraced the celebration and really made folks feel welcome. There's a HUGE difference in how successful that makes the event, and (coincidentally or not) it also seems to track closely with the overall atmosphere of the store.